IT MAY be a map to the greatest archaeological find in history. Oddly enough, it’s a retired arson investigator who may have decoded it. Jim Barfield, director of the Copper Scroll Project, and his colleague Chris Knight join us to discuss the controversial Copper Scroll, who wrote it, and what they were trying to preserve. Also: Trump walks from North Korea talks; fighting between nuclear powers in Asia; unsafe spaces for children; the retail apocalypse; Israel shoots for the moon; and ... See More African church walks back a miracle. Plus: There is still time for you to join us in the Holy Land this year! The SkyWatchTV Wars of the Gods Tour of Israel May 12-23, with Sharon K. Gilbert, Pastor Carl Gallups, and messianic Rabbi Zev Porat, includes an exclusive guided tour of Qumran with Jim Barfield, founder of the Copper Scroll Project. Download our free mobile app! 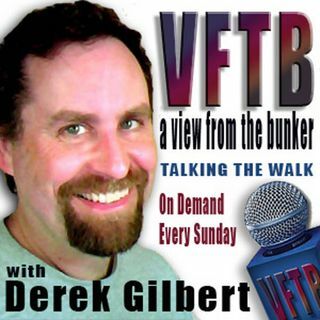 Links to the iTunes App Store and Google Play are posted at www.vftb.net. Discuss these topics at the VFTB Facebook page (www.facebook.com/viewfromthebunker) and check out the great Christian podcasters at the Revelations Radio Network (www.RevelationsRadioNetwork.com). And we are proud to be part of the Fringe Radio Network (www.spreaker.com/user/mxpw)!